Charlotte Home Inspection performs a detailed Roofing inspection of every home. Charlotte Home Inspection inspects the roof coverings and records the roofing materials. Charlotte Home Inspection inspects all roof flashings and records any abnormal findings. Charlotte Home Inspection inspects all skylights, chimneys, and roof penetrations and records any abnormal findings. Charlotte Home Inspection inspects the roofing drainage systems including gutters and downspouts and records anything that needs further investigation. A homeowner tries to fix a leak by stuffing a tee shirt against the chimney. 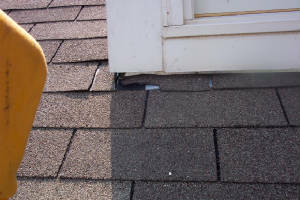 Torn roof shingles can lead to leaks. A roof leak staining the roof sheathing.